Wheew. Okay, it's been a good while (okay.. like 3 weeks) since I've done a Teaser Tuesday *sigh* I know.. I'm such a slacker.. BUT, I'm here now and I have an awesome teaser for you guys! I haven't started reading anything this week (again.. major slacker mode) but I did start reading a book last week. 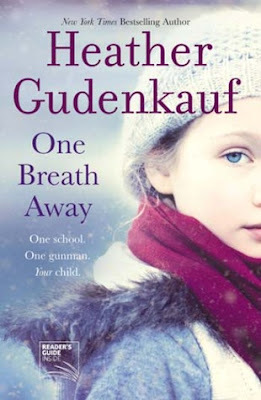 It's called One Breath Away by Heather Gudenkauf. Let me just tell you now... it is a really good book and I absolutely love it so far. "I love you, too." My eyes fill with tears and I can feel the moisture pool beneath the bandages that cover my injured eye. I wait for Augie to disconnect when I hear three quick shots, followed by two more and Augie's piercing screams. Okay I forgot to grab my tissues , I want to read this but not sure if i can handle it. I haven't gotten my Teaser up yet, will later I have to figure out what I am reading LOL. Good teaser! I like the cover, especially right now that it's super hot over here! Nice teases! Haven't heard of this one! Good teaser even though it's a sad topic. I want to know what happens. omg what's going on!! love the teaser but it sounds so sad and depressing! One school. One gunman. Your child. Whoa. Sounds intense! Thanks for stopping by!